Iranian Foreign Minister Mohammad Javad Zarif is in India this week for a bilateral visit to discuss a range of issues. Zarif concludes his visit on Wednesday. 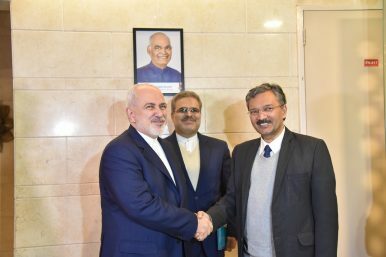 At the top of the agenda during Zarif’s visit is the issue of how Iran could continue energy exports to India despite looming U.S. sanctions, implemented in the aftermath of the Trump administration’s decision to withdraw the United States from the 2015 Joint Comprehensive Plan of Action (JCPOA), a multilateral agreement to cap Iran’s civil nuclear program. Zarif took a defiant tone on U.S. sanctions and said that Iran’s relationship with India would remain strong. “No economic power can tell us you cannot have [a] relationship with India. This can give you confidence on the partner you are choosing,” Zarif said at a public address to an India-Iran business forum. After Saudi Arabia and Iraq, Iran has been energy-hungry India’s third-largest source of crude oil. In the aftermath of the 2015 JCPOA, Iran’s share of Indian oil imports rose from 7 percent in the 2015-2016 fiscal year to 13 percent in the 2016-2017 fiscal year, according to data from the Indian Ministry of Commrce. In November, India—alongside China and South Korea—received a U.S. waiver allowing it to continue purchasing a limited amount of Iranian oil. The U.S. sanctions waivers are designed to allow importers of Iranian oil to substitute their consumption of Iranian crude. New Delhi, however, remains determined to find a way to continue to import Iranian oil and other goods. On Tuesday, Nitin Gadkari, an Indian cabinet minister, announced that an Iranian bank would be permitted to open a Mumbai branch in the first half of 2019. “The government of India has given permission to the Iranian bank to open its branch in India in Mumbai within three months,” Gadkari said. Iran will reciprocally allow India‘s UCO Bank to open a branch in Iran to facilitate continued commercial activity between the two sides. Gadkari additionally said that India and Iran may explore bartering arrangements. Outside of energy imports and other commercial activity, India has a growing strategic interest in Iran in the form of the Chabahar port, where New Delhi has made substantial investments. The port will allow Indian goods to travel to Afghanistan via Iranian soil, bypassing Pakistani territory entirely. “The first ship from Brazil has already been received at Chabahar… The financial arrangement is ready. There were some problems, but we have resolved the issues,” Gadkari noted on Chabahar. He added that India hoped to fully operationalize the port, which is on Iran’s southern coast in the province of Sistan-Balochistan. Iran's foreign minister visits New Delhi to lay the groundwork for increased bilateral cooperation.